Data is vital to every app and experience we build today. With increasing amount of data, organizations do not want to be tied down by increasing infrastructural costs that come with it. Data engineers and developers are realizing the need to start moving their on-premise workloads to the cloud to take advantage of its massive scale and flexibility. Azure Data Factory capabilities are generally available for SQL Server Integration Services (SSIS) customers to easily lift SSIS packages to Azure gaining scalability, high availability, and lower TCO, while ADF manages resources for them. Azure Resource Manager (ARM) Virtual Network (VNet) to access data on premises. Ability to host catalog of SSIS projects (SSISDB) in Azure SQL Managed Instance or Azure SQL Database with VNet service endpoint. Azure Hybrid Benefit (AHB) to leverage existing on-premises SQL Server licenses to lower costs. Enterprise Edition to use advanced/premium connectors and transformations. Custom Setup to install custom/third party components on Azure-SSIS IR, and more. Ability to trigger and schedule SSIS package executions as first-class activities in ADF pipelines and combine them with other activities. New licensing model for ISVs to develop paid components and extensions for Azure-SSIS IR and join the growing third party ecosystem for SSIS in ADF. Data engineers and developers can continue to use familiar SQL Server Data Tools (SSDT) and SQL Server Management Studio (SSMS) to design, deploy, configure, execute, and monitor SSIS packages in the cloud. All of these capabilities are now generally available. 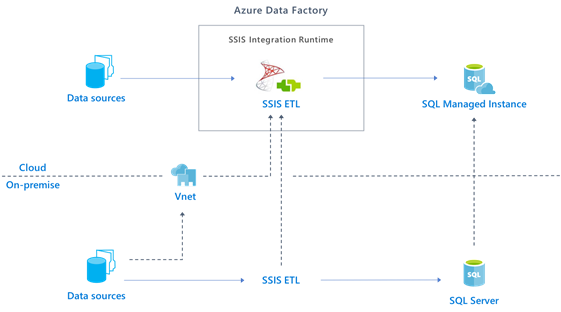 Modernize and extend ETL workflows to automatically provision Azure-SSIS IR on-demand, just-in-time, inject built-in data transformations, and much more with SSIS in Azure Data Factory. Go through hands-on-lab to lift SSIS packages to Azure with ADF. Read more about how to run ETL workflows with SSIS activities in ADF pipelines. Learn more about Enterprise Edition custom set up and 3rd party extensibility for SSIS in ADF.